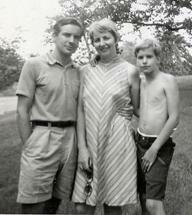 Chet, Gloria, and Christian Doherty in 1967. THE ACTOR was not one of our top-tier series. It was one of our "historical" shows – those supposedly old series that we manufactured for "rerun" purposes for "broadcast" on our Ch. 45 day marathons (if this is all too confusing, check out "About the Networks," on the navigation bar at left for an explanation of how our network broadcasting worked). The giveaway is the copyright dates: "To Kill an Actor" supposedly comes from 1963, when we would have been all of seven years old! The shows were probably made in 1971, and they are not very inspired. Clearly based on THE SAINT television series, each one opens with Christian Doherty, in his best English accent, extolling the virtues of a city (London) or country (Mexico) he is visiting (we apparently chose the country by the available music we had on hand; for instance, a Mexican-sounding cut from Earl Hagen's I SPY album took us to Mexico). The plots are interchangeable: in each episode, someone is trying to kill the hero, either for revenge or out of feelings of jealousy. That hero is called Chet Doherty, and, although the credits say everyone in the series is fictional, Chet was a real person: he was Christian's father. Chet was actually an actor by trade (mostly theatrical roles and also TV appearances), but he was nothing like Christian's re-imagining of him. The real Chet was soft-spoken and American; THE ACTOR's Chet is more like a manic Simon Templar. He is a suave Englishman given to hysterical outbursts (more Patrick Johnson – Christian's GUN FOR HENRY persona – than Roger Moore). This fictional Chet is also some kind of detective. "There is a man in the United Kingdom who fights for law and order," explains the opening credits' speech. "There is a man who knows how to handle a gun and get the crooks in jail. There is a man who knows what he's doing. Posing as an actor, Chet Doherty is a man we all want to fight for our country. Chet Doherty is The Actor." Why he used the cover as an actor is never explained (nor, for that matter, is it explained why he has a housekeeper with the strange name of Mrs. Moshoopkee). It is apparently not much of a cover since various people will come up to him in a given episode and say, "You're The Actor." His notoriety is so great, in fact, that a police inspector even tries to kill him because he is jealous. The acting aspect was only used in one episode, "Playing the Death Game." In that story – inspired by any number of SAINT or AVENGERS episodes - Chet is being stalked by Robbie Roberts (me), a rather dim-witted ex-con who attempts to kill The Actor at a public performance of MACBETH. The most noteworthy aspect of the episode was the way it got Christian and me to actually read and perform Shakespeare – something we would have been reluctant to do at school (and listen as we stumble over antiquated words that we were probably seeing for the first time). In any event, Chet Doherty was real. He died a few years ago, and this is what Christian wrote in his memory: "My love is with you, father, wherever you are. Show me your best side toward the camera. The microphone is held, you begin to speak. The Actor among us is with us always. You used to mention 'Monty' a lot. You said that you were the last person who could be Monty Clift. Yet, in some ways you are very close to the man you portrayed in life. Sometimes, Mr.Williams can be haunting us until our mortality fails to gain momentum. My love is with you, wherever you are." Chet is menaced by a foe who swears to murder him during a performance of Macbeth. Chet: Christian Doherty. While in Mexico, The Actor (Christian Doherty) faces death threats. Pre-credits sequence from lost episode of the series. With Alan Saly.